Environment, tradition, and religion in KSA call for conservative clothing for both men and women. The traditional dress habits evolved around reducing sun exposure in the hot months and protection from the cold during nights in the desert and colder months. Thick clothing and head scarfs are used by the Saudi population. With reduced outdoor activities, the population is now less exposed to the sun. Previous studies showed low levels of vitamin D in KSA. , However, these studies had small sample sizes or were not nationally representative. To examine the levels of vitamin D among the Saudi population, we conducted a large household survey including biomedical examinations. The Saudi Ministry of Health and its Institutional Review Board (IRB) approved of the study protocol. The University of Washington IRB has deemed the study as exempt from IRB since the Institute for Health Metrics and Evaluation received de-identified data for this analyses. All the respondents consented and agreed to participate in the study. We used verbal consent that was captured by our computer program since it is commonly used and accepted in KSA. Two verbal consents were obtained: One for the household roster (obtained from the head of the household or the most knowledgeable person in the house) and another obtained from the randomly selected respondent. If the randomly selected respondent was between the ages of 15 years and 17 years, consent was obtained from his/her parent(s) or legal guardian on the individual's behalf for his/her participation in the study. The KSA Ministry of Health and The University of Washington IRB approved the verbal consents that were obtained in this study. The Saudi Health Interview Survey (SHIS) is a national multistage survey of individuals aged 15 years and above. Households of Saudi citizens were randomly selected from a national sampling frame maintained and updated by the Census Bureau. The Ministry of Health divides KSA into 13 health regions, each with its own health department. We divided each region into subregions and blocks used by the KSA Department of Statistics. All regions were included, and a probability proportional to size was used to randomly select subregions and blocks. Households were randomly selected from each block. A roster of household members was collected and an individual aged 15 years or more was randomly selected to be surveyed. If the randomly selected adult was not present, our surveyors made an appointment to return, and a total of three visits were made before the household was classified as a nonresponse. Weight, height, and blood pressure of the randomly selected adult were measured at the household by a trained professional. Hypercholesterolemia, otherwise known as high or abnormal blood cholesterol?" Women diagnosed with diabetes or hypertension during pregnancy were not counted as having these conditions. Those who reported diagnosis of any of these conditions were asked if they were currently receiving any treatment for their condition. Measured diastolic or systolic blood pressure not exceeding the appropriate threshold, but the respondent reported taking medications for hypertension. Their measured diastolic blood pressure was between 80 mmHg and 89 mmHg or systolic blood pressure was between 120 mmHg and 139 mmHg. Respondents who completed the questionnaire were invited to local primary health care clinics to provide blood samples for laboratory analysis. All blood samples were analyzed in a central laboratory at the King Fahd Medical City in Riyadh, Riyadh Province, Saudi Arabia. Respondents were considered to have a deficient level of vitamin D if blood work showed a vitamin D level below 28 ng/mL. Respondents were considered to have a sufficient level of vitamin D if blood work showed a vitamin D level between 28 ng/mL and 107 ng/mL. Respondents were considered to have a toxic level of vitamin D if blood work showed a vitamin D level above 107 ng/mL. Measured cholesterol not exceeding 6.2 mmol/L but the respondent reported taking medications for hypercholesterolemia. Their measured blood cholesterol level was between 5.18 mmol/L and 6.2 mmol/L. Respondents under treatment for hypercholesterolemia were considered controlled if their measured cholesterol levels were below 6.2 mmol/L. Measured HbA1c not equaling or exceeding 6.5% (48.5 mmol/mol) but the respondent reported taking medications for diabetes. Hence, the subgroup diabetic included those with measured HbA1c equal or above 6.5% or taking medication for diabetes. Respondents were considered to have borderline diabetes if: 1) they did not report taking drugs for diabetes, and 2) their measured HbA1c blood level was between 5.7% (35.3 mmol/mol) and less than 6.5% (48.5 mmol/mol). We used a backward elimination multivariate logistic regression model to measure the association between vitamin D deficiency and consumption of vitamin D and all associated factors. All factors were first included in the models and variables and were eliminated based on a Wald chi-square test for analysis of effect. Variables were removed one by one based on the significance level of their effect on the model, starting with the variable with the highest P > 0.5 until all the variables kept had a P ≤ 0.5 in the analysis of effect. The logistic regression excluded cases with missing data. We used SAS 9.3 for the analyses and to account for the complex sampling design. Between April 2013 and June 2013, a total of 12,000 households were contacted and a total of 10,735 participants completed the survey (response rate of 89.4%). The remaining 1,265 participants completed part or all of the household enumeration but the selected individual did not complete the survey. A total of 5,590 individuals went to the local clinics and provided blood samples for analyses, which led to a response rate of 52.1%. Of these, there were missing data on blood vitamin D levels in 586 individuals and missing data on consumption of vitamin D supplements in 876 individuals. 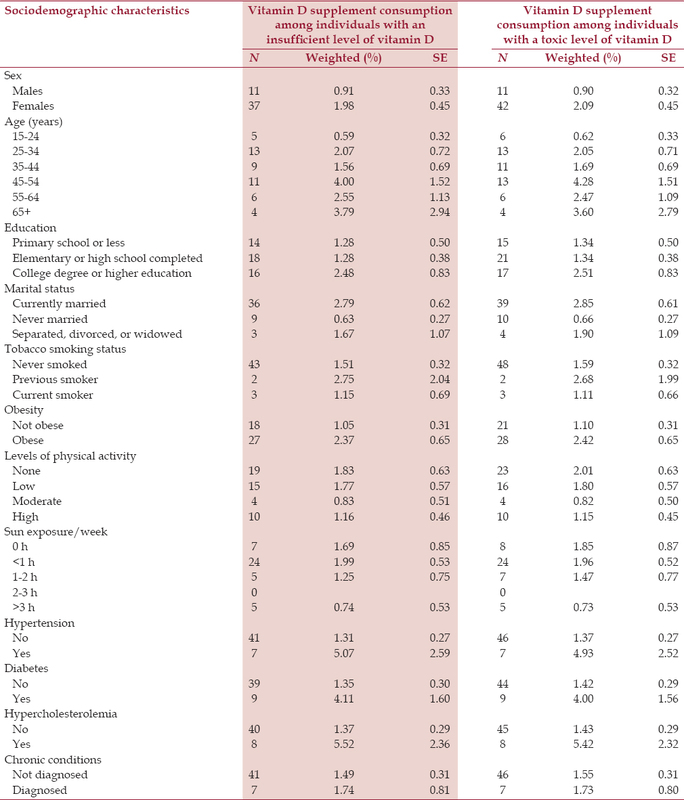 Overall, 40.6% males and 62.7% females had insufficient levels of vitamin D. The sociodemographic characteristics of SHIS respondents by vitamin D blood levels are presented in [Table 1]. 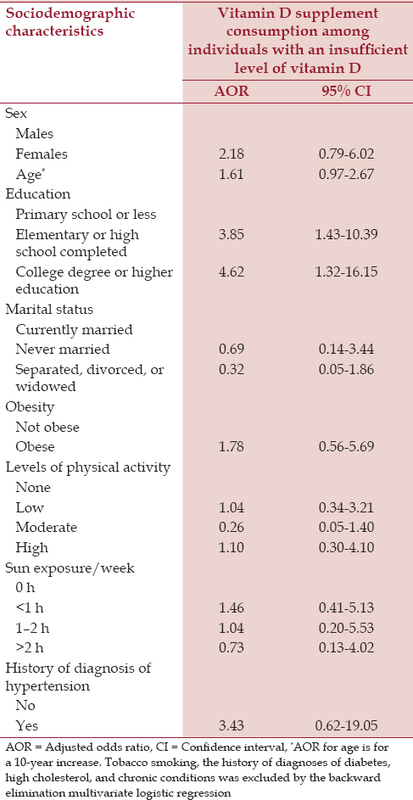 Young and unmarried individuals were more likely to have insufficient levels of vitamin D [Table 1]. Women [adjusted odds ratio (AOR)=2.69, 95% confidence interval (CI) = 2.09-3.47], individuals who had never married (AOR = 1.77, 95% CI=1.29-2.44), and obese individuals (AOR = 1.30, 95% CI= 1.01-1.67) were more likely to have deficient blood levels of vitamin D, compared to men who were currently married and nonobese individuals [Table 2]. Current smokers (AOR = 6.1, 95% CI = 1.31-27.48) were more likely to have toxic blood levels of vitamin D in comparison to those who were never smokers or previous smokers. Individuals with low levels of physical activity were less likely to have toxic levels of vitamin D (AOR = 0.21, 95% CI = 0.05-0.89) [Table 2]. 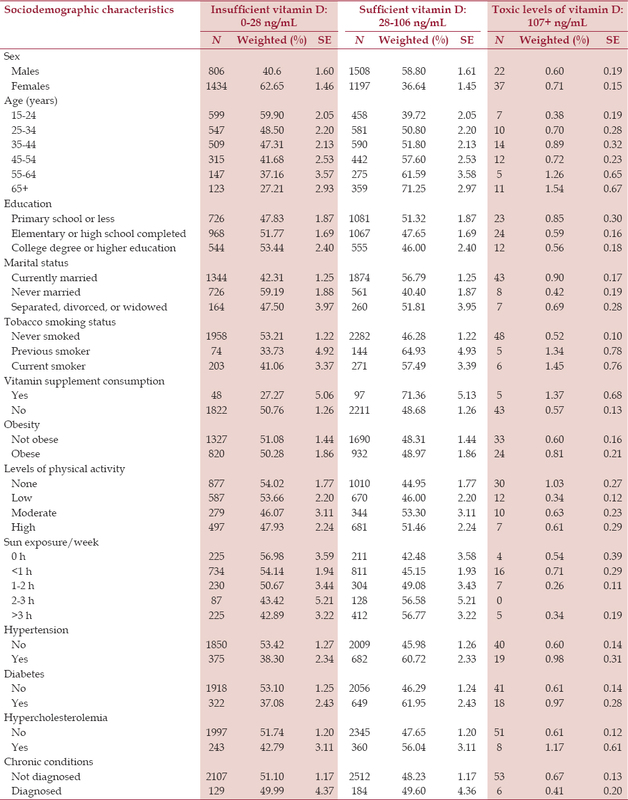 The sociodemographic characteristics of SHIS respondents of vitamin D supplement consumption according to vitamin D sufficiency are presented in [Table 3]. Vitamin D supplement consumption was low [Table 3]. We found that the likelihood of consuming vitamin D supplements among those with an insufficient level of vitamin D was higher among individuals who had completed high school education (AOR = 3.85, 95% CI=1.43-10.39) or college or higher education (AOR = 4.62, 95% CI= 1.32-16.15) [Table 4]. Sun exposure was not associated with vitamin D supplement consumption among this group. Our study is the first national one to report blood levels of vitamin D and the consumption of vitamin D supplements among individuals in KSA. Our findings revealed high rates of vitamin D deficiency. These findings are surprising, given the amount of sunshine in KSA. Indeed, vitamin D deficiency may be overlooked as a health problem in the country due to this fact. Our study calls for a national plan to increase awareness of the importance of vitamin D and its sources and to encourage the monitoring of blood levels among those taking supplements. The Saudi Ministry of Health developed its own guidelines and adopted them for the country. Vitamin D levels were assessed using Roche Hitachi COBAS 8000. No unique cutoffs exist for deficient, sufficient, and toxic serum levels of vitamin D. The Institute of Medicine defined vitamin D deficiency as blood levels less than 11 ng/mL for neonates, infants, and young children and less than 12 ng/mL for adults. More recently, 25-hydroxyvitamin D (25(OH)D) serum levels between 20 ng/mL and 32 ng/mL have been defined as sufficient. NHANES III defined vitamin D deficiency as serum levels below 15 ng/mL. Others suggest that the most beneficial serum concentration of vitamin D begins at 30 ng/mL. Some scientists agree on 20 ng/mL as a minimum desirable serum concentration of 25(OH)D.  Alshahraniet al. suggested that 25(OH)D serum levels between 20 ng/mL and 32 ng/mL were insufficient. A common definition for high serum vitamin D concentrations is also lacking: serum levels above 100 ng/mL or 150 ng/mL have been suggested as indicative of toxicity. We used the Saudi Ministry of Health guidelines for vitamin D for our cutoff points. Lack of sunlight exposure, lack of availability of vitamin D-fortified foods, and lack of or insufficient vitamin supplementations were the most likely factors explaining the high prevalence of vitamin D deficiency. In KSA, these three sources are lacking. Minimal sun exposure is mainly due to the use of protective clothing. Saudi men and women wear the abaya and the headscarf, minimizing any sun exposure outdoors. Hence, it is crucial to inform Saudis about the need for sun exposure and how it should be achieved while reducing the risks of melanoma and nonmelanoma skin cancer from sun exposure. The current guidelines recommend daily supplementation of vitamin D for individuals at risk of vitamin D deficiency. The Endocrine Society and the American Academy of Pediatrics recommend a daily intake of 400 IU/day of vitamin D for children under 1 year of age, 600 IU/day for individuals aged 1-18 years, 600 IU/day for individuals aged 19-70 years, and 800 IU/day for individuals aged 70 years and above. However, levels of 2,000 IU/day for children under 1 year of age, 4,000 IU/day for individuals aged 1-18 years, and 10,000 IU/d for individuals aged 19 years and above may be needed to correct vitamin D deficiency. The optimal vitamin D levels for protection against cancer, autoimmune diseases, depression, and many other health problems are unknown. Clear guidelines are urgently needed to guide both the public and health officials to improve blood levels of vitamin D.
Few foods naturally contain vitamin D2 or D3. In the United States, milk, yogurt, cereal, and some bread products are fortified with vitamin D. Saadat-Ali et al. showed that food items consumed in the Eastern Province of KSA were not fortified. Therefore, Saudi health officials should consider such an approach to improve vitamin D levels in the country. Our study had some limitations. First, our data were from a cross-sectional study and therefore, we could not assess causality. Second, many of our behavioral data such as diet and physical activity were self-reported and subject to recall and social desirability biases. Third, we used Saudi cutoff points for vitamin D blood levels instead of international ones. Fourth, only 52% of the respondents completed the visit to a health clinic and had their blood drawn for analysis. However, our weighting methodology accounted for this bias by applying a poststratification adjustment using sociodemographic characteristics, health behaviors, previously diagnosed noncommunicable diseases, and anthropometric measurements of the respondents from the household survey. Finally, our study was based on a large sample and used a standardized methodology for all its measures. Our study was of great importance, as it revealed that vitamin D levels in countries with plenty of sun such as Saudi Arabia were low and required action to improve them in order to decrease the burden of disease associated with the low levels of vitamin D. Moreover, our findings are certainly relevant for other countries in the Gulf region or countries with similar cultures, clothing, and religions. Awareness campaigns, taking into account the culture of the region, need to be developed and implemented in KSA to highlight the importance of vitamin D and educate residents about the best ways to improve vitamin D levels. Moreover, these programs should include monitoring of vitamin D levels in order to avoid toxicity. Our study showed a high prevalence of vitamin D deficiency among Saudi men and women. Our results call for increased awareness to ensure adequate levels of vitamin D for better health in Saudi Arabia. Moreover, there is a need to inform the population about the importance of vitamin D and its sources in the Saudi diet. Our study also showed that very few Saudis use a supplement. Hence, it is crucial that those with low levels of vitamin D be encouraged to improve their diet and use supplements. At the same time, health professionals should caution individuals on supplement use to ensure that they do not reach toxic levels. In a country with plenty of sun, it is important to inform the public that vitamin D is an issue to monitor when outdoor exposure is minimal. We would like to thank Kathrine Muller at the Institute for Health Metrics and Evaluation for editing the manuscript. None of the authors declare a conflict of interest. Lips P. Vitamin D physiology. ProgBiophysMolBiol 2006;92:4-8. Cranney A, Horsley T, O'Donnell S, Weiler H, Puil L, Ooi D, et al. Effectiveness and safety of vitamin D in relation to bone health. Evid Rep Technol Assess (Full Rep) 2007;1-235. Takiishi T, Gysemans C, Bouillon R, Mathieu C. Vitamin D and diabetes. Rheum Dis Clin North Am 2012;38:179-206. Cutolo M, Otsa K, Uprus M, Paolino S, Seriolo B. Vitamin D in rheumatoid arthritis. Autoimmun Rev 2007;7:59-64. Cao Y, Winzenberg T, Nguo K, Lin J, Jones G, Ding C. Association between serum levels of 25-hydroxy vitamin D and osteoarthritis: A systematic review. Rheumatology (Oxford) 2013;52:1323-34. Elsammak MY, Al-Wosaibi AA, Al-Howeish A, Alsaeed J. Vitamin D deficiency in Saudi Arabs. HormMetab Res 2010;42:364-8. Elsammak MY, Al-Wossaibi AA, Al-Howeish A, Alsaeed J. High prevalence of vitamin D deficiency in the sunny Eastern region of Saudi Arabia: A hospital-based study. East Mediterr Health J 2011;17:317-22. Memish ZA, El Bcheraoui C, Tuffaha M, Robinson M, Daoud F, Jaber S, et al. Obesity and associated factors - Kingdom of Saudi Arabia, 2013. Prev Chronic Dis 2014;11:E174. Global Database on Body Mass Index-BMI classification. World Health Organization. (Accessed December 22, 2014, at http://www.assessmentpsychology.com/icbmi.htm). National Heatlth and Nutrition Examination Survey (NHANES). Health Tech/Blood Pressure Procedures Manual. CDC; 2009. (Accessed December 22, 2014, at http://www.cdc.gov/nchs/data/nhanes/nhanes_09_10/BP.pdf). Institute of Medicine (US) Committee to Review Dietary Reference Intakes for Vitamin D and Calcium. Dietary Reference Intakes for Calcium and Vitamin D. Washington (DC): National Academies Press (US); 2011. (Accessed December 10, 2014, at http://www.ncbi.nlm.nih.gov/books/NBK56070/). Dawson-Hughes B, Heaney RP, Holick MF, Lips P, Meunier PJ, Vieth R. Estimates of optimal vitamin D status. OsteoporosInt 2005;16:713-6. Gibson RS. Principles of Nutritional Assessment. Oxford University Press; 2005. Bischoff-Ferrari HA, Giovannucci E, Willett WC, Dietrich T, Dawson-Hughes B. Estimation of optimal serum concentrations of 25-hydroxyvitamin D for multiple health outcomes. Am J ClinNutr 2006;84:18-28. Norman AW, Bouillon R, Whiting SJ, Veith R, Lips P. 13 th Workshop consensus for vitamin D nutritional guidelines. J SteroidBiochemMolBiol 2007;103:204-5. Sadat-Ali M, AlElq A, Al-Turki H, Al-Mulhim F, Al-Ali A. Vitamin D levels in healthy men in eastern Saudi Arabia. Ann Saudi Med 2009;29:378-82. Naeem Z, Almohaimeed A, Sharaf FK, Ismail H, Shaukat F, Inam SB. Vitamin D status among population of Qassim Region, Saudi Arabia. Int J Health Sci (Qassim) 2011;5:116-24. Gröber U, Spitz J, Reichrath J, Kisters K, Holick MF. Vitamin D: Update 2013: From rickets prophylaxis to general preventive healthcare.Dermatoendocrinol 2013;5:331-47. Osteoporosis and Musculoskeletal Disorders: Preventing Osteoporosis. 2014. (Accessed December 22, 2014, at http://www.iofbonehealth.org/preventing-osteoporosis). Bruyere O. Fracture prevention in postmenopausal women. Am Fam Physician 2005;71:2151-2. Avenell A, Mak JC, O'Connell D. Vitamin D and vitamin D analogues for preventing fractures in post-menopausal women and older men. Cochrane Database Syst Rev 2014; 4:CD000227. Sadat-Ali M, Al-Habdan IM, Al-Mulhim FA, El-Hassan AY. Bone mineral density among postmenopausal Saudi women. Saudi Med J 2004;25:1623-5. Al-Turki HA, Sadat-Ali M, Al-Elq AH, Al-Mulhim FA, Al-Ali AK. 25-Hydoxyvitamin D levels among healthy Saudi Arabian women. Saudi Med J 2008;29:1765-8. Hall LM, Kimlin MG, Aronov PA, Hammock BD, Slusser JR, Woodhouse LR, et al. Vitamin D intake needed to maintain target serum 25-hydroxyvitamin d concentrations in participants with low sun exposure and dark skin pigmentation is substantially higher than current recommendations. J Nutr 2010;140:542-50. Don't seek the sun: Top reasons to get vitamin D from your diet. American Academy of Dermatology. (Accessed December 22, 2014, at https://www.aad.org/media-resources/stats-andfacts/prevention-and-care/vitamin-d). Holick MF, Binkley NC, Bischoff-Ferrari HA, Gordon CM, Hanley DA, Heaney RP, et al. Evaluation, treatment, and prevention of vitamin D deficiency: An endocrine society clinical practice guideline. J ClinEndocrinolMetab 2011;96:1911-30. Sadat-Ali M, Al Elq A, Al-Farhan M, Sadat NA. Fortification with vitamin D: Comparative study in the Saudi Arabian and US markets. J Family Community Med 2013; 20:49-52.